There are 10 diamonds to find – will you cash out or keep hunting? Keep an eye on your lives! To play Diamond Deal, simply begin opening boxes. You are hunting for the 10 diamonds hidden on the board of 50 squares. If you pick 10 diamonds in a row, you win the jackpot! Each time you find a diamond, your current prize will increase and you have the choice of whether to cash out or not. If you open an empty box, you will lose one of four lives and your prize amount will fall. Every time you find a diamond your lives will reset to four. The board consists of 50 squares – there are 10 diamonds hidden on the board. If you have found a diamond, a winning animation will display showing your prize counting up, your lives resetting and the cash out button will flash. If the square does not have a diamond, you will see a life light switched off and the prize amount fall. Once the player has found a diamond, he or she can choose whether to cash out or continue. To win the jackpot, the player must find 10 diamonds in a row from the first choice. Occasionally the jackpot may be capped to a certain amount. This figure will be shown as the ‘Jackpot’. After finding the maximum number of diamonds required to reach the jackpot, the game will automatically award the win. This does not impact on RTP, except for a minor positive advantage in the player’s favour. 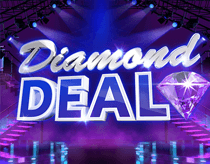 Diamond Deal is a chance based game where the outcome is NOT pre-determined. This means that the players choices are meaningful within the context of the random number generator calculating the odds of a diamond being found within a given square. The player chooses whether to cash out or not at each square after the first diamond has been found.